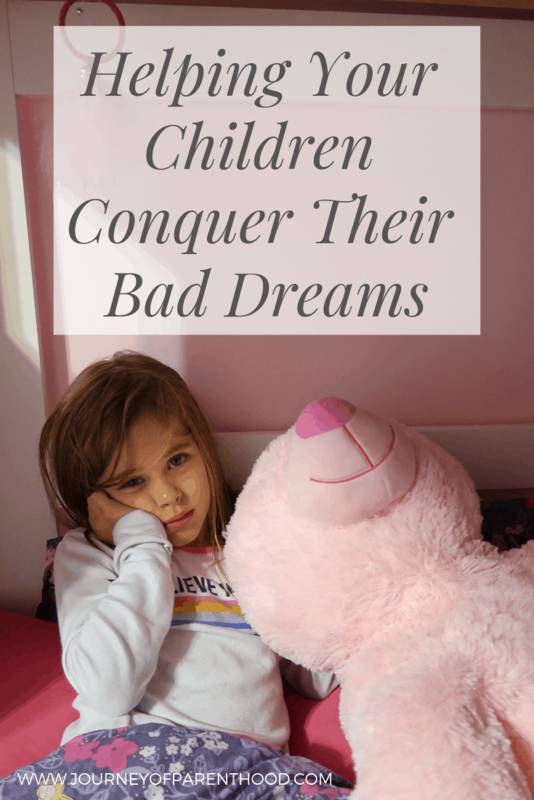 NIghtmares and Children: Helping Your Kids to Conquer Bad Dreams. Originally on Team Cartwright. Nightmares and fears go hand in hand so I’d recommend reading this post I wrote about preventing childhood fears. We have a hard rule in our house: stay in the bed. Our kids know they aren’t allowed to get out of bed or leave their bedrooms unless it’s an emergency or for a quick potty break etc. It’s hard as a parent when you are DEAD asleep and then gets woken up by a child because they had a bad dream. I personally wake up pretty grumpy and I have to try to not take that annoyance out on my child at that moment. It’s important to recognize a bad dream as what it is: a one time, stand-alone insistent. It’s not the child coming out of bed to say they want a glass of water or need a bedtime story or some other sleep delay tactic. They truly had a horrifying experience and they need our comfort and love in that time to help them work through it! Yes, there can become a cycle of waking up and getting out of bed due to bad dreams, but most of the time children who experience nightmares don’t have them nightly or on a regular enough basis to have them become a true sleep disruption. So show grace and don’t overly fret that it’ll become a routine. I never tell my kids “go back to bed” whenever they wake me up due to a nightmare. This is one of those moments in parenting when I believe they truly need us. They need our comfort and love and support. I always go to their room with them and snuggle in their bed and talk. I never tell them they are silly for being scared or make them feel inferior for having fears. Dreams aren’t always a reflection of reality. Just because I’ve had awful dreams about apes attacking me doesn’t mean I think it’ll actually happen or that I have any sort of weird issue with apes. It’s just a dream but in that moment it felt and seemed real and my body has a true physical response to that fear. When we are afraid our adrenaline starts pumping and it’s hard to calm down. Offering comfort and support helps our children relax and allows them to work through the dream with us. A HUGE thing for me with my nightmares is that if I wake up from them and then go back to sleep I tend to continue having that same nightmare. It’s like my mind can’t stop focusing on it until the dream plays out in its entirety. My brain needs that conclusion in order to move on. This is the biggest thing I make sure to do with my own children. We sit and we talk through the entire nightmare from the start until the point when they woke up. And then we keep going. We finish the story. How it plays out. What would happen next. And turn it into a positive conclusion. During this work through of the dream, I also use it as an opportunity to lovingly remind them of reasons not to be fearful. For example, one of our daughters has dreams about octopus coming into her room. Yes, it sounds silly but this is a true fear of hers. As we talk through the dream I remind her that octopus live in the ocean and they can’t live on land. I remind her we live very far away from an ocean. I remind her that they would have a hard time opening the doors with their slippery tentacles. I remind her we have an alarm on our house that would go off and call the police if they did try to get in. And lastly, I always remind her that Mommy and Daddy will protect our children and that we’d kill that octopus if he tried to get to her. By talking through the dream together and coming to the conclusion of the dream it helps for the child to be able to go back to sleep and not continue on with the same dream. It also allows them to focus on that positive ending and the reminders that they are safe and protected. While it’s extremely important for my kids to feel safe and that they trust in their parents to always protect them, it’s my goal as their mom to raise them to trust GOD. I want their faith and trust and comfort to always come from Him. He will always be there for them, I can’t be. When I talk through my children’s nightmares with them I always, always end in prayer. I also remind them that anytime they are afraid they can pray. They each keep a Bible beside their beds that they are allowed to read anytime they desire. Even if that means 3 am after a bad dream. I have also written out the verse Isiah 41:10 for them: “Fear not for I am with thee” as a source of comfort during times of fear. To be totally transparent…I even recite the verse to myself when my husband travels and I get a bit scared! Prayer is a way for us to communicate with our ultimate Father and protector and the one who can give us the greatest comfort. Whenever my children are fearful or wake from nightmares I always leave them with a mission. We talk through everything and pray together and then I tell them in the morning I want to hear their 5 favorite snacks, or the 5 things they are most excited about on our next vacation, or 5 gifts they want for Christmas. Etc, etc. Giving them a task gives them something to focus on. Counting sheep? Who really is calmed by doing that? But thinking about something we love to do or are looking forward to in the future? It’s calming, relaxing, and a joyful way to drift off into sweet dreams! Growing up I had several different things to help ease my nightmares. A dream catcher above my bed, a special stuffed animal, and even a tiny cross that I’d sometimes sleep with against my heart. While these things may not truly help ward off bad dreams, they can make a world of difference in the mind of a child. There are also many different types of essential oils on the market today that are aimed at helping children sleep and even some that claim to help with good dreams! While many people have different opinions regarding oils, I have the “it can’t hurt” kind of approach. 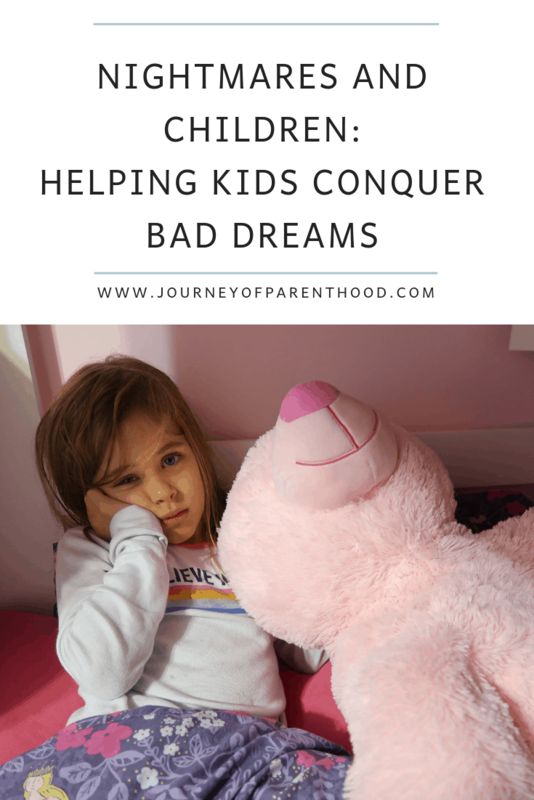 When my kids have a bad dream? I will bust out some “special sleep oil” for them. Even just their knowledge of having this special oil helps in relaxing them! Find things that help your child and give them the best comfort and ability to best fall back to sleep. Some people are just wired to have nightmares. My husband very rarely dreams at all and rarely remembers them when he does but I have always had very vivid dreams many of which are horrifying. I don’t have any science or anything to back it up but I just assume that my dreams are part of my genetic makeup and that my kids may also have similar sleep issues. However, sometimes nightmares are triggered by outside sources. When your child wakes from a nightmare, work backward and make sure there isn’t anything that could be done in the future to prevent them from happening again. Has there been a big life change? A lack of sleep? Disruption in normal routine? Access to non-age appropriate content? A movie or book that they could have found scary? Many children will experience a nightmare at some point in their lives. Being prepared for those moments will help any parent to better be able to respond in love and comfort for their child and help everyone get back to sleeping soundly and happily!